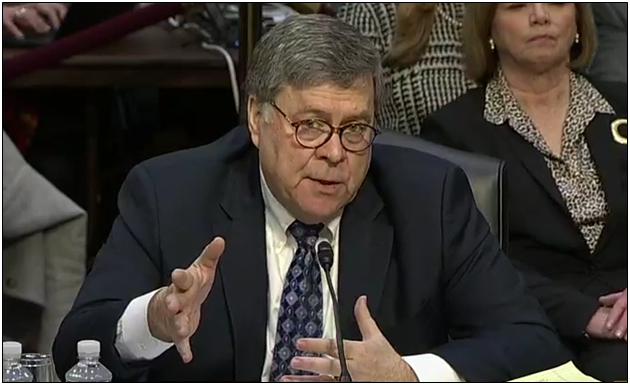 That was Attorney General nominee William Barr’s answer to a question from Sen. John Cornyn (R-Texas) at his first confirmation hearing on Jan. 15 about whether the counter intelligence investigation by the Justice Department into the Trump campaign that began in 2016 constituted an improper instance of the incumbent political party going after the opposition party. It’s the right answer by Barr. He should not pre-judge the probe by Special Counsel Robert Mueller without the facts in hand. But neither should Barr assume anything about how the Russia collusion probe got started prior to Mueller or that getting to the bottom of the case’s predicate will be so easy. It’s actually a really great question — one of the most closely guarded secrets in Washington, D.C.
By the looks of things, the Justice Department and FBI were out to get President Donald Trump from day one in 2016 on allegations that he was a Russian agent, and then lied about the scope and extent of their investigation to the President after he was elected and to Congress in public hearings. This much at least has been confirmed in the latest revealing report by the New York Times on the origins and extent of the Obama administration’s investigation, first into candidate Donald Trump and his presidential campaign, and then carried over into the Trump administration after he was inaugurated. Finally, the straw that breaks the camel’s back according to the Times is the firing of Comey, at which point “law enforcement officials became so concerned by the president’s behavior that they began investigating whether he had been working on behalf of Russia against American interests…” So convinced they were of Steele’s allegations, they apparently even thought the Comey firing was a part of the collusion plot. But let’s take the New York Times article at face value. Let’s say Trump calling Putin “a very strong leader” and saying Obama was not caught the nation’s intelligence agencies’ attention. Perhaps coincidentally or perhaps not, Trump campaign official George Papadopoulos was approached just four days later in Italy, on March 14, 2016, by Joseph Mifsud with promises of connections to Russian government officials. Later in April, Mifsud would promise Papadopoulos dirt on Hillary Clinton from Russia, according to Special Counsel Robert Mueller: “‘the Russians had emails of Clinton’; ‘they have thousands of emails…’” presumably from her private server. No emails were ever delivered to Papadopoulos. Papadopoulos now contends that they were not Russian agents at all, but Western intelligence operatives whose job it was to set up and sabotage the Trump campaign. That, in short, the UK and other Western intelligence agencies were using their own agents against the Trump campaign in 2016 in a sting operation to ferret out Russian collusion. Papadopoulos was later prosecuted for incorrectly stating when his hiring by the Trump campaign was in conjunction with the first Mifsud meeting, which both occurred in March 2016. Was Trump’s “refus[al] to criticize Russia on the campaign trail” the genesis of that investigation, and did it lead to Papadopoulos being targeted first by Mifsud and later by prosecutors, who apparently did not find a crime to investigate him for until they questioned him? Overall, Trump’s campaign proposal to try to improve relations with Russia is essentially non-criminal and not even controversial. It’s a political question. Presidents since Dwight D. Eisenhower have sought, with varying degrees of success, to improve relations with Moscow, not because they were traitors, but to avert the very real possibility of hot war that might go nuclear and kill us all. It’s not the FBI’s job to figure out why presidential candidates think Putin might be a strong leader or not. If that’s how this all got started it was dumb. We know the reason for trying to improve relations with Russia was to enable Trump’s proposed policy of teaming up to destroy international terrorists like Islamic State. Working with Russia against terrorists was something then-campaign advisor Michael Flynn had also advocated for publicly. It wasn’t a mystery. They could’ve watched Flynn’s video in Dec. 2015 in Moscow with a Russian television journalist on Youtube and read public reports stating Flynn was advising Trump at the time to figure that out. But they knew all of that already. After all, this could have begun as a policy disagreement with Flynn and then after the election was won by Trump became a means of sabotaging that policy. If that was indeed the basis for the investigation, Barr should take a close look, because foreign policy is a political question that presidents have the power to determine. And it is the American people, not the FBI, who gets determine if the policies proposed by presidential candidates are wise or not. The people voted for Trump, even if disgraced former FBI agents Peter Strzok and Lisa Page did not. Looking at the other items mentioned as prompting the counter intelligence probe, Trump was joking at a press conference in July 2016 when he suggested that perhaps Russia could find Hillary Clinton’s deleted emails from her private server that contained classified information. That was never a basis for a criminal probe. As far as the 2016 Republican National Committee Platform is concerned, anyone can look it up, which states of Ukraine: “We support maintaining and, if warranted, increasing sanctions, together with our allies, against Russia unless and until Ukraine’s sovereignty and territorial integrity are fully restored. We also support providing appropriate assistance to the armed forces of Ukraine and greater coordination with NATO defense planning.” It calls for more sanctions on Russia, the restoration of Ukrainian territory from Russia and assistance to Ukrainian armed forces against Russia, and we’re led to believe that this is a provision of the platform that Russia wanted because the words “lethal defensive weapons” were removed and replaced with “appropriate assistance” in the process of inserting the language into the platform. Again, not a crime and even if the preference was in order to be less provocative towards Russia — you know, because of that World War III problem where we all die — it was not at all inconsistent with Trump’s stated policy at the time to improve relations with Russia. J.D. Gordon, who was responsible for modifying the provision, has not been charged with being a Russian agent or providing text for the platform from Moscow. He has stated that at the convention when the amendment was being debated he told the co-chair of the committee to table the amendment in light of Trump’s policy position on Ukraine weapons, when it was ultimately modified to remove explicit mention of weapons and then strengthened to include the call for sanctions. It’s not a crime to view U.S. military assistance in Ukraine as a potential flashpoint that risks war with Russia. Again, that’s a policy disagreement the American people could mete out in the 2016 election, and did, in favor of President Trump, who warned about actions that might lead to war with Russia. In any event, as President, Trump has sent weapons to Ukraine anyway. How is sending weapons to Ukraine doing Russia’s bidding? Which leaves the Steele dossier, which accused Trump campaign officials Paul Manafort and Carter Page of being directly involved in a conspiracy to work with Russia to hack the DNC and put the emails on Wikileaks, but neither have been charged with that. Former Trump attorney Michael Cohen was supposed to be in Prague meeting with Russian agents to deal with the fallout of Wikileaks, but to this day, even after he has been sentenced for unrelated campaign charges, he says he was never there, so he very well couldn’t have been there talking to Russian agents about anything. In the end, it was the Steele dossier that was used by the FBI to get the Foreign Intelligence Surveillance Act warrant against Trump campaign official Page beginning in Oct. 2016. In Jan. 2017 former FBI Director James Comey called the allegations in the dossier “unverified,” yet it was renewed three times even though they had apparently no idea if the allegations were true. All the while, once Trump was on his way into office, and after he was sworn in, the FBI via Comey repeatedly lied to the President and Congress about the extent of the investigation. Andrew McCarthy of the National Review, also a former federal prosecutor, wrote on Foxnews.com that this was an attempt to cover up the investigation. So, you had the outgoing Obama administration spying on the opposition party in an election year, and then carried over the investigation into the Trump administration after the President won the election. When it didn’t find corroboration for the allegations against Trump, even with the surveillance, that should have been the end of it. Instead, the FISA warrant was renewed three times. And still the probe persists, as Special Counsel Robert Mueller still has not delivered his final report to Congress. Rather than admit the original basis for the investigation, the Steele dossier and Papadopoulos set ups, were without merit, the Special Counsel has moved full speed ahead with prosecuting individuals named in it for unrelated crimes. Barr should ask if people should be investigated and prosecuted because their boss, a presidential candidate, has a policy disagreement with the FBI. When former FBI Director James Comey was fired, reportedly, according to the New York Times, that’s when the FBI moved for a criminal prosecution of Trump. Paul Manafort was convicted with unrelated bank and tax charges (the question of him discussing polling data with a Russian still has nothing to do with the DNC hack or Wikileaks, either), Michael Flynn was charged with lying to investigators about a conversation after the election with the Russian ambassador regarding sanctions, George Papadopoulos was charged with not remembering when he was hired by the Trump campaign, Michael Cohen was convicted of unrelated campaign charges to do with paying for non-disclosure agreements to alleged Trump mistresses and Carter Page hasn’t been charged with anything. So far, no Americans let alone anyone in the Trump campaign have been charged with working with Russia to hack the DNC and put the emails on Wikileaks. So, this investigation based on a false charge, that Trump was a Russian agent, was carried over into the Trump administration and then Trump fired the person leading it, James Comey, which, we’re led to believe, was obstruction of justice, even though, under the Constitution and federal law, the President has the power to fire the FBI Director and to have input on the investigations the Justice Department pursues. They cannot prove the first charge, so they’ve shifted to trying to prove that defending himself against a false charge and reorienting the Justice Department to solving real crimes is a crime. At the end of the day, Barr must get to the bottom of indeed what the predicate to this investigation was, and determine if it was all about getting Trump as much as it is about rescuing the reputation of the FBI and the Justice Department. If he cares about these institutions as much as his testimony indicates, he should care deeply that it was used politically. For, if the Justice Department under Mueller continues to pursue politically motivated prosecutions that would have never been pursued had Trump never been elected leading to legal action against the President, not for espionage but for insisting he was no Russian agent, it will do nothing to restore public confidence in the administration of justice. Instead, it will leave it irreparably in shambles, with a view that only Republicans get prosecuted and even then, if you’re innocent, the facts won’t matter. They’ll get you all the same. It may be important for Special Counsel Mueller to finish his investigation so that the country can see that the issue is resolved, but if the genesis of the investigation was politically motivated and laid upon false foundations, the American people need to see that issue resolved as well. Barr has his work cut out for him.